What They Say....Once upon a time, a girl named Sophie Drake danced with the fairies in the woods behind her grandparents' Louisiana home. 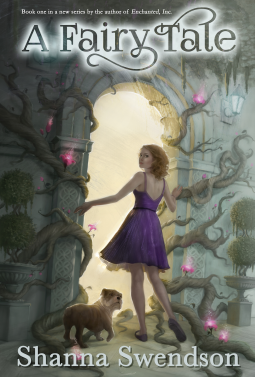 But she closed the door to the fairy world and turned her back on the Fae when they tried to steal her little sister Emily. Fourteen years later, Sophie heads to New York City on a desperate mission. Emily, now an up-and-coming Broadway actress, has gone missing. Only Sophie suspects the Fae. That's a lot for a small-town ballet teacher to tackle, but with the unlikely aid of her sometimes flighty sister, a pair of elderly shopkeepers with a secret, a supremely lazy (but surprisingly knowledgeable) bulldog, and a wounded police detective searching for his own missing person, she just might prevail--if she can force herself to confront her own past and face her true nature. What I Say.... This was a fun read. I always say that I don't really like fantasy, but then I read books like this and I realize that I actually do enjoy fantasy. I just need it to be fantasy that feels somewhat rooted in reality. This book was the perfect blend of the two. Emily is an actress in New York, who lives above an injured NYPD officer. When she goes missing after a performance, her sister Sophie comes to New York to find her. Part of what kept me hooked was the way the story crossed between the Fairy Realm and New York. I enjoyed the way the different characters moved between worlds. The climax of the book felt like an Indiana Jones type adventure, and the end didn't tie up with a "happily ever after", but it ended with me waiting for the sequel!